Infopulse starts a set of specialized step by step tutorials for beginners, dedicated to building solutions with Microsoft open-source cross-platform technologies stack together with Docker. In these tutorials, we’ll explain beginners how to create your own solutions with the help of the bleeding-edge technologies by Microsoft and Google like Angular 4 and .NET Core, run a .NET solution in Ubuntu (the most popular Linux-based server platform), and make it independent and portable. This task may sound hard, but in fact, you can accomplish all that with ease. In this first part of our tutorial, we’ll talk about creating a basic Angular 4 and ASP .NET Core application in Windows 10 Environment. .NET Core – a platform developed and maintained by Microsoft, and which can compile, debug C# code and work on Windows, Linux or Mac. 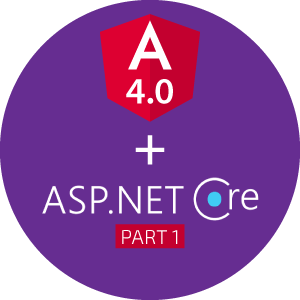 We will use it to write a .NET Core + Angular 4 application. Angular 4 – one of the most popular front-end frameworks developed and maintained by Google. We will use it to create a dynamic and attractive web interface. 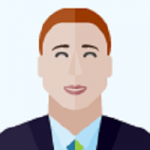 This new version of the framework (just like the previous one – Angular 2) is based on TypeScript developed and maintained by Microsoft. Microsoft SQL – a relational database management system developed by Microsoft. In this solution, we will use Azure SQL Database to increase the portability of our solution. MongoDB – one of the most popular NoSQL databases. We will use it as an alternative to the SQL database (Microsoft SQL) to cover more data store scenarios. Visual Studio Code (VS Code) – a lightweight cross-platform IDE to write C# and front-end code. Now, we will start creating our web application step by step in Windows 10 environment and continue developing on Ubuntu. Please note that your machine should have the latest versions of Node.js and .NET Core SDK and Runtime installed. Creating an initial Angular 4 + Webpack solution is a complicated process, and it gets even more complicated as new software is released and you need to change your approach on the fly. Thus, we suggest using Angular CLI (a command line interface for Angular) to streamline this process. Let’s start with installing Webpack and Angular CLI. The initial Angular 4 project is now ready. Highlighted in red are the project files. The .NET Core project was successfully created. Both projects have been created but they don’t interact with each other yet. Actually, we should put static files in .NET Core content root folder – wwwroot. We need to adjust Webpack to put bundled files to the wwwroot folder. Visual Studio Code is a powerful cross-platform IDE that can be enhanced by extensions to make it even more effective. To work with .NET Core, you will need to add a C# extension to Visual Studio Code. Don’t forget to save all edited files. If you noticed that your code in *.cs files is underlined as error – just execute dotnet restore command in PowerShell to restore packages and references, which you specified in the *.csproj file. Let’s send a really simple message from our back-end and display it in the browser. Explanation: there are two types of routing – conventional routing and attribute routing. We use RouteAttribute (attribute routing) to define a routing. You can also use Configure method in Startup class to define a routing (conventional routing) but RouteAttribute is a preferable way to do it. In HelloController class we return just a simple string “Hello Angular4 and ASP.NET Core from Windows 10” to show that it really works. Further in this tutorial, we will create a more useful sample. Now our endpoint is ready. You can execute dotnet run command and go to http://localhost:5000/api/hello in a browser to test it. Further, we’ll request this endpoint in our front-end part in order to return a response on the page. Create a new app.service.ts file in src/app folder. Explanation: we have defined a new TypeScript class and tagged it by @Injectable decorator to use it as dependency injector. In this class, we’ve got just one method that opens a communication channel in which response of the endpoint can be emitted. For this purpose, we use the “Observable” class. Explanation: we have added an OnInit interface like a lifecycle hook to this file and ngOnInit method from this interface in order to call the code when data-bound properties of a directive will be initialized. In this method, we have subscribed to the observable channel from AppService. We’ve uploaded the final version of this simple proof of concept to the GitHub repository. Enjoy the tutorial and let us know if you have any questions or comments. 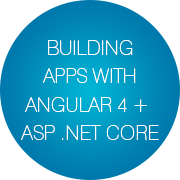 In the second part of our tutorial, we are talking about creating an ASP.NET Core + Angular 4 application in Docker container with the connection to SQL Azure Database. Stay tuned!